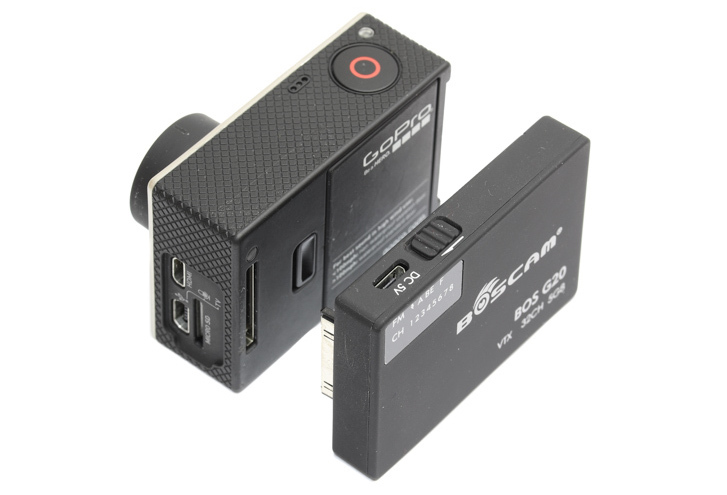 The Boscam G20 is a super easy to use wireless video streaming solution for filmmakers using the GoPro Hero3/4. It's a compact lightweight self-contained video transmitter unit that plugs directly into the back of the GoPro to send a video and audio back to a video receiver. As the unit broadcasts on 5.8GHz frequency, the transmission is in real-time so you don't get an annoying delay like you do when using the GoPro's WiFi live preview function. The range is also much greater than WiFi, in open space it can transmit up to 300m. The G20 is quick and easy to use. Power it on before fitting it to your GoPro and select a channel using the mode button on the side of the unit. A long press cycles through the bands A, B, E, F and a short press cycles between channels 1-8. With a 500mAh internal battery it charges via a micro usb socket and has a runtime of 2 hours per charge. To receive the video stream we recommend pairing it with one of our 5.8GHz FPV monitors or a 5.8GHz video receiver like the RC832.